The benefits of liquid cooling without the hassle of swapping heatsinks. 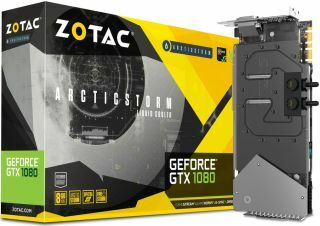 If you like the idea of water cooling your graphics card but not the thought of swapping out the existing heatsink, Zotac has gone and done the dirty work for you with its new GeForce GTX 1080 ArcticStorm. All you have to do is plug the card in and connect the standard G1/4-inch threading fittings to your liquid cooling loop. In place of an air cooler is a full body ArcticStorm waterblock. It's made of lightweight aluminum and uses a direct contact copper cold plate. Right above it sits a 0.3mm micro-channel structure to allow for more contact area with the liquid inside the block for better heat dissipation. Despite the full body waterblock, Zotac didn't overclock the card much at the factory—it sports 1,632MHz base and 1,771MHz boost clocks, up from Nvidia's reference blueprint of 1,607MHz base and 1,733MHz boost clocks. Hey, at least it's something. Zotac brings even more attention to the card with RGB LEDs that are part of its Spectra LED lighting system, which you can customize and control using Zotac's FireStorm software. There's no word yet on pricing for availability.